After having last weekend off you would expect to the Quinnipiac Bobcats men's ice hockey to have the batteries charged and itching at the bit to get back in action. That was not the case Friday night as the #11/12 Bobcats dropped their ECAC opener 2-1 to the #18 Cornell Big Red. Despite what head coach Rand Pecknold described as a good week of practice, the Bobcats played the majority of this game making sloppy mistakes, poor passes along with another zero on the power play and not enough compete level to match what Cornell brought in this game. It was a fluke goal on the Cornell power play that was the difference in the game for the winners from Ithaca, New York. While the teams played to a scoreless tie in the first Cornell controlled a lot of the play, was physical and had the better scoring opportunities. Quinnipiac goaltender Andrew Shortridge was a big reason the game was scoreless after one period of play. Cornell broke through on the scoreboard first when they scored off an odd man rush just after they killed a Quinnipiac power play. Slick passing by Mitch Vanderlaan and Beau Starrett lead to Brendan Smith's first goal of the season for the Big Red. 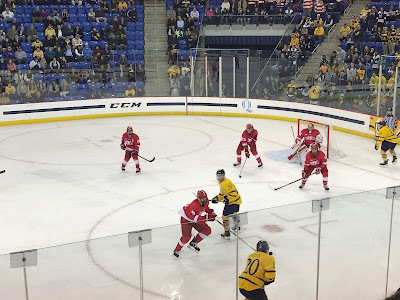 While Quinnipiac picked up the play a bit in the third period, Cornell got the fluke game winning goal 12:36 into the period when an Alec McCrea shot hit teammate Morgan Barron and deflected into the air past Andrew Shortridge for the power play goal. 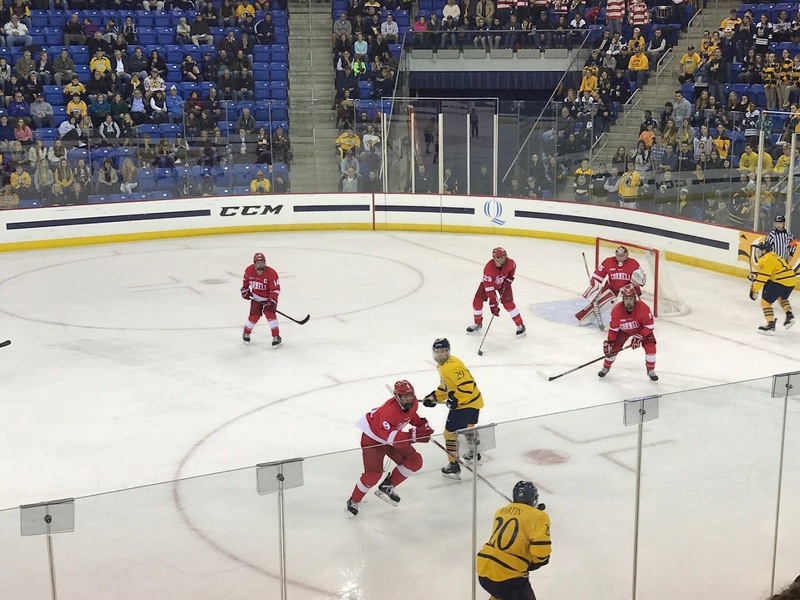 Quinnipiac would answer almost two minutes later on Matt Forchuk's first collegiate goal when he put home a soft pass from Scott Davidson past Cornell's Matthew Galajda. While Quinnipiac would have a few more chances in the final five minutes they couldn't muster one past Galajda giving the Bobcats their first loss in conference play. 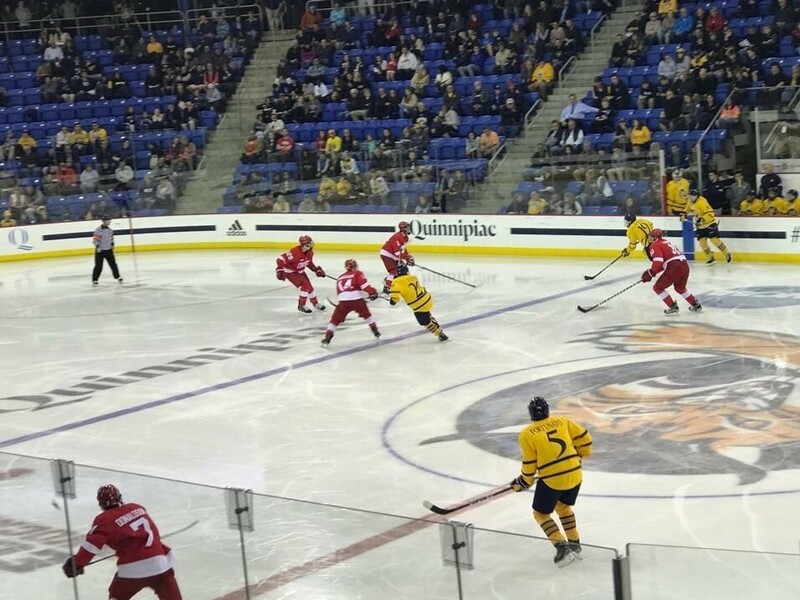 Quinnipiac which fell to 3-2-1 also lost Thomas Aldworth to a gruesome injury when he took a skate to his forearm that left a trail of blood on the ice. Whether he plays tomorrow night is still uncertain but the Bobcats have a hot goaltender in Colton Point coming in off a 45 save shutout performance in a tie with Princeton to worry about along with finding answers to score goals in order to salvage the weekend.